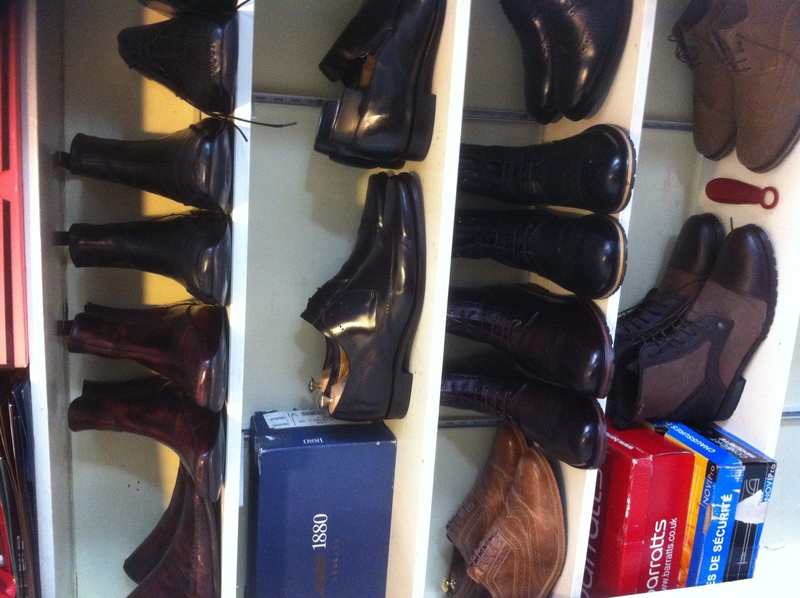 Developing a Shoe Fetish 1: How many pairs does a man need? A few months ago I found myself in the surreal situation where in a meeting I was chairing at work my colleagues somehow got into a conversation about shoes. I have a fairly charismatic and extrovert colleague and I lay the blame squarely at her feet for leading us astray. It was clear that I had lost control of the meeting so I suggested that we might usefully break for lunch and pick up the agenda after lunch. Over lunch is where the conversation got interesting; female colleagues talked about where they liked to buy shoes and shared shoe buying habits whilst we males kept quiet, looking a little embarrassed by it all. One male colleague mentioned quietly that he owned only a single pair of shoes. I believe his argument was that since he can only wear one pair at a time he therefore only needs to own one pair at a time. As far as I could see every possible eventuality for the male wardrobe could be covered by a carefully selected item in each of these categories. I can’t say that I rigidly followed these but they were my guiding principles. Occasionally, I would own more than one pair of smart black shoes as one pair overlapped with the ones that were being replaced, etc. However some years ago, well before I began my 5-year project, things began to change for me. I bought a pair of smart black shoes that I didn’t really need. I bought them because I liked them. I felt a bit guilty about this for a while. After all I didn’t really need two pairs of smart black shoes, did I? Somewhere along the line, however, I abandoned my minimalist shoe collection approach. I say abandoned, I can’t recall a specific moment of turning my back on previously held principles. Nonetheless, I have noticed over the last few years that shoes have assumed far greater importance in my wardrobe than they had previously. 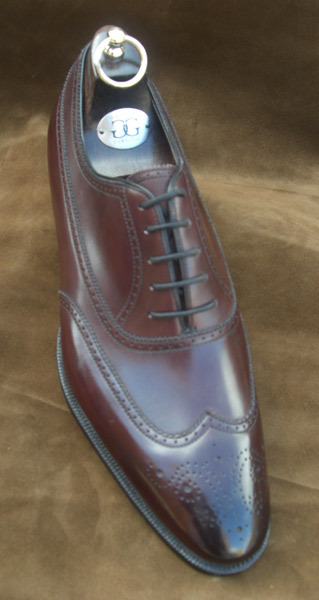 I have always had a partiality to a nice shirt or suit but my developing shoe fetish is a new experience. For this I blame my cousin who came to visit us a few years ago. 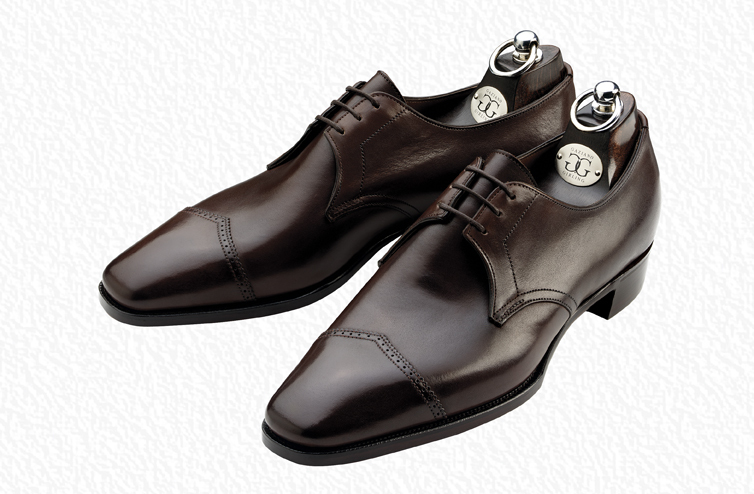 I was almost exactly halfway through my 5-year project and had built up a nice collection of shirts, ties and suits but had not given much attention to my shoes. I had a pair of shoes that I wore to work which were in many ways the perfect shoe. They were incredibly comfortable and light. They were my shoes of choice if I was commuting in London and running up and down Tube escalators or simply spending long days on my feet. They were smart and versatile and looked just as good with a suit as with a pair of jeans. Best of all they had cost me the princely sum of £7! That is not a misprint you read it correctly! I loved them! I bought 2 pairs, one in black and another in brown. At that price you would, wouldn’t you? I wore them nearly everyday, but let’s face it you get what you pay for and these were not the last word in quality so by the time of my cousin’s visit a couple of years ago my black pair were beginning to wear out. 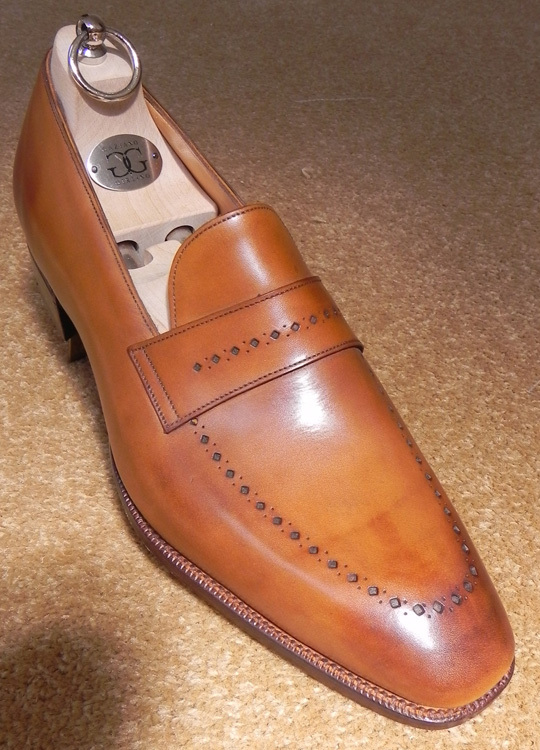 I say wear out; one actually had a hole in the leather uppers. I say leather…. Did I mention 7 quid?? We were preparing to move house and at some point my cousin caught sight of my shoes as they were being packed up and couldn’t believe that these were shoes that I was still wearing to work. The question that made me laugh most was this: ‘Does your wife know that you are wearing such terrible shoes?’ I tried (unsuccessfully) to defend these shoes that I loved so much. In response I was given a proper tongue lashing, told that I should be ashamed of myself and ordered, under no circumstances, to wear those shoes to work, or indeed anywhere else again. 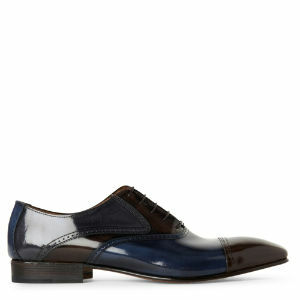 Moreover, that I was admonished that since I was about to move to a new job I really ought to get a new pair of shoes. So I began looking for shoes. As you might have worked out by now, I am fundamentally a bit tight. However, I have large feet and finding great shoes in my size at a good price is not always simple. I turned to the web and discovered Barratts online. I was familiar with their high street shops (before they closed most of them) but had not realised that they had a far wider range online and with larger sizes readily available. 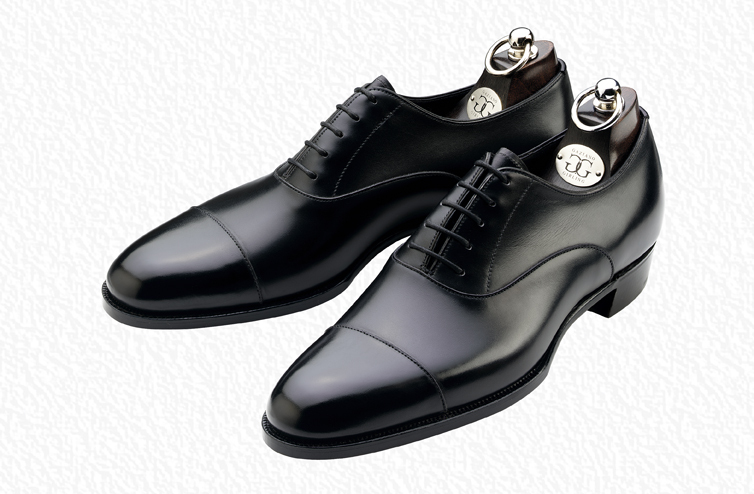 While on the web a whole vista opened up and I discovered a whole range of shoes that were incredibly beautiful but often unbelievably expensive for men of modest means. Somewhere along the line I moved from being a guy who thought it unnecessary to own more than a single pair of black shoes to a guy who owns multiple pairs of black shoes for different contexts. 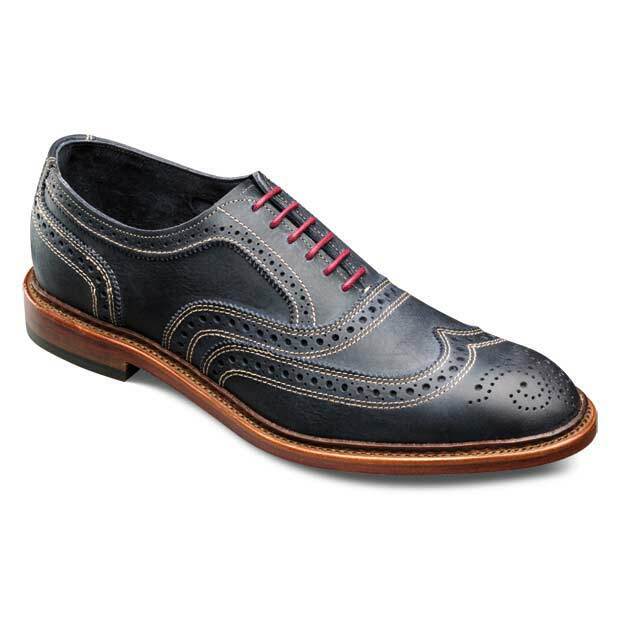 In the same way that I understand why I might wish to own more than a single blue shirt ( and I do have a little more than one) I now understand why I might wish to have more than a single pair of black shoes in a range of styles and with different levels of formality. 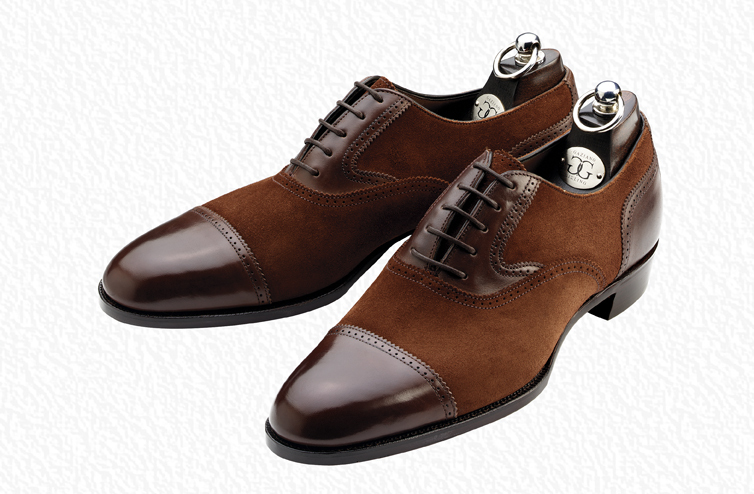 Brown shoes have even greater flexibility as there are so many shades of brown from light tan, through to walnut, through to dark chocolate. As for the original question, how many pairs of shoes does a man need? I don’t know. While I see no need to give Imelda Marcos a run for her money, in my case I feel a need just a few more pairs. Having developed a decent collection in black and brown I feel ready now to broaden my colour palette. In year 5 of my 5-year project I find that shoes have emerged as priority items. Currently I am keeping my eyes open for brogues in Navy or Grey with Olive a distinct possibility. A great way to round out my 5-year project. Always happy to give it!